Keep your toilet clean and germs free, use the most effective and instant cleaner Domex Toilet Expert Lemon Explosion Toilet Cleaner. Make end of the unseen dirt spreading germs that occupies every corner of your toilet. Domex Lemon Explosion is a strong and powerful toilet cleaner that comes with an advanced thicker formula, which kills 99.9% germs with the help of sodium hypochlorite. It is even good at removing tough stains and leaves behind a quaint, clinical and hygienic atmosphere. 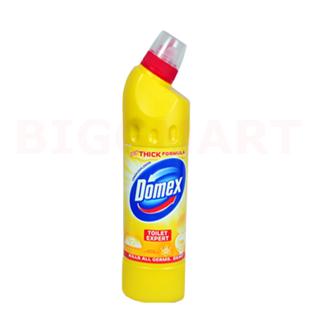 Domex, the very much known brand to offer highly effective toilet cleaners. The company emerged in the year 1997 with the vision to offer the best products that ensures to protect you and your family from germs and diseases. To stay safe and hygienic, use the most powerful Domex Toilet Expert Lemon Explosion Toilet Cleaner.